I recently made this quilt top in a couple of hours. It actually took me longer to cut than to sew! 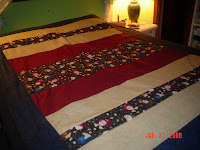 It is fairly easy and straight forward and would be a great quick quilt. I purchased it in a kit because I love snowmen! I don't know how I am going to quilt it yet, but time will tell - I also need to find "just the right" backing and binding. I would love to find a plaid or striped fabric for the binding.